There are loads of creative workshops happening at d3 every weekend! There’s a creative drawing workshop on Aug 4th & 18th, book binding and painting for the older kids on Aug 11th, and so much more! See all the workshops here. Ready to explore an indoor tropical rainforest? Filled with flora and fauna, The Green Planet Dubai is one of the coolest places to take the kids. You’ll be able to explore the bat cave, hang out with sloths, and check out the flooded rainforest. They’ve also got a summer camp for the kids. There’s a LEGO Ninjago activation happening at Dubai Festival City right now, and the kids will seriously love it! From fun challenges to free building zones, there’s so much to do. Alternatively, there’s also a LEGO activation at Dubai Mall, where families can get creative and use LEGO bricks to build an ideal city of the future. Both kids and parents will love this interactive and educational museum. With 8 galleries and over 40 exhibits that are creatively designed to inspire and stimulate, there’s just so much to learn at Oli Oli Dubai. If you haven’t already, you need to check this out. Don’t worry, this beach party is indoors! Dubai Marina Mall has set up an awesome indoor beach this summer, and there’s fun for all ages! There are games, arts & craft activities, and a beach party for the little ones, while grown ups can win prizes by finding one of the 50 gold balls! Roller coasters, 360 degree spin rides, haunted houses and more – there is sooo much to do at IMG Worlds of Adventure this summer! Kids of all ages, make sure to try the Predator, the Hulk Spin, Spider-Man’s Doc Ock’s Revenge, the Powerpuff Girls ride and of course, the Velociraptor! From zip lines and trampolines to bumper cars and VR rides, Modhesh World is one of the coolest things to do in Dubai with kids this summer! This entire place is filled with games, rides, and entertainment for all ages! Whether you want to get up close to a mountain gorilla, walk with a herd of African elephants, see our planet from above, experience the ice cold Mt. Kenya or plunge into the deep blue sea – you can do all of that and more at Orbi Dubai. Mixing together SEGA’s innovation and actual footage from BBC Earth, this is the real deal. 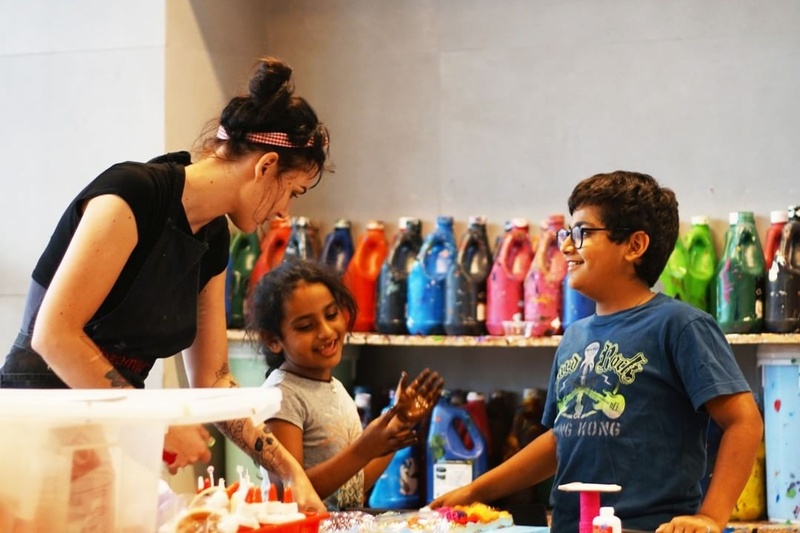 Get your creative juices flowing and sign up for a fun painting session at the jam jar Dubai! You can join in on a public workshop, sign you kids up for a youth programme or if you’re a natural, you can even do it yourself. Out of all the fun sports and activities at Dubai Sports World, one of the coolest challenges to try is the Ninja Warrior Challenge by Just Play! Better yet, they’ve got two obstacle courses side by side, one for the adults and one for the kids. From zip-lining on punching bags to swinging on tires to running up walls, the place is filled with fun obstacles. The Ripe Market has moved indoors for summer, and they’ve got fun for all ages! Head to Times Square Centre every Saturday to shop from local businesses, pick up organic fruits and veg, or sign up for a pop-up fitness class while the little ones are busy trying out fun activities and workshops.